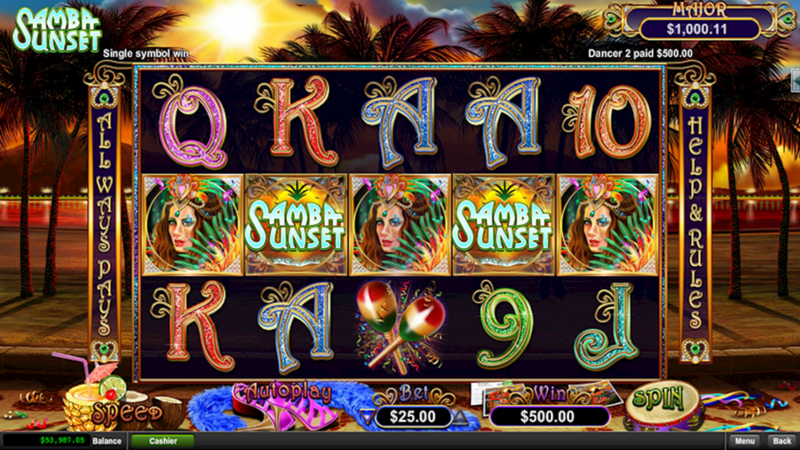 Experience the taste of carnival through the latest slot release from Real Time Gaming, with its colourful graphics and exotic music this vibrant game gives you a taste of South America in the comfort of your own home. If you like high tempo, energetic slots this is the one for you, it has a stunning background which transports you to an eye catching beach setting. The 3D graphics are proof of real progression which greatly enhances the overall experience for gamers. The slot is a 5 reel all ways pays offering, which boasts fantastic incentives for all players with 243 different opportunities to win on any spin. This feature compliments the gameplay really well and will ensure entertainment value on par with any slot Real Time Gaming has released over the past few months. The wild symbol is the Samba Sunset, when it appears on reels 2 and 4 it replaces the other symbols except for the scatter. The wilds are a good feature of this game as they can appear intermittently and produce fantastic payouts doubling any prize when in a winning combination. The scatter symbol is the bay and 10 free games are awarded when 3 or more of the scatters appear from left to right, this can be re-triggered once, which then awards 5 more games at the end of the 10 free ones. Extra dancer symbols are added to to the reels before each free game however no extra free games may be won during this time. With bonus features like these it’s easy to see this slot will be a big hit addition to the games currently on offer at All Star Slots. If its atmosphere, passion, warm sunny beaches and a carnival atmosphere you desire then look no further!